How to Create a Group in the Habbo Hotel 2016 - Habbriol "Habbo Hotel Nosso Passatempo"
To create your own group, you have to be a member HC. It costs 10 credits create a group of Habbo, and how the Group owner you are able to decide some different things - we'll talk about it soon. 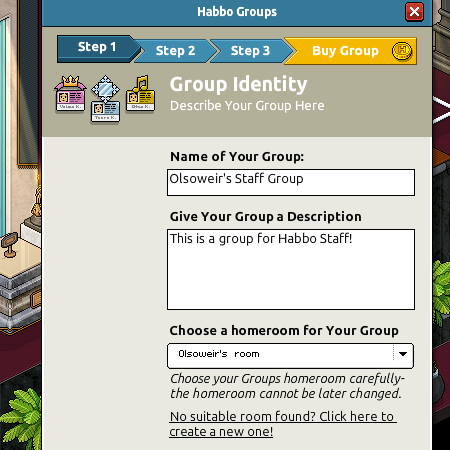 To purchase a Habbo Group, choose your color group and customize your badge, you need to go to the shop icon at the bottom of the toolbar, and go to 'Habbo Groups' on the side of the Shop menu. 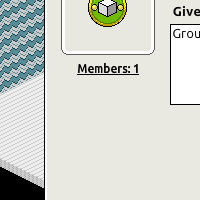 After you said you want to buy a Habbo Group, you will be asked to give a name and description for your group. These are both very important - almost as important as the group's emblem - as is how your group will appear to potential members Habbo Group! In the next two steps, you will be able to customize both the color scheme of your group and emblem of the group. Remember, you can always go back to change the color scheme of the emblem and after you created the group. But, you must remember that if you decide to do this, Habbos that are already part of your group can agree with these changes, and some may not recognize the new Group emblem as well. There are many things you should consider when running a Group Habbo success! Once you have made your Habbo Group, you'll want to be able to manage it to make sure it is as easy to come in and participate as possible! To manage your group, go to Homeroom and click "Manage" on the right side of the screen. This will bring up another window where you can modify badge, color scheme, name and description of the group. But more importantly, this is where you can change the group's access settings, and is also where you can change which the group members have administrator rights. Administrators are able to change the way the Homeroom looks -. That is, they are able to "decorate" the Homeroom To make the members of the existing group admins, you have to click on the link "Members' below the emblem. To change the type of group, and Group Rights, you have to go to the screen "Managing groups," and click the Settings tab. "From there, you can decide whether the group is closed, open, or is a group 'application for membership'. You can also decide whether the members of the ALL group can decorate the Homeroom, or only Administrators. For a more in-depth FAQs style Habbo Groups tab, go here.